If any person is injured or killed in a traffic accident, the police must be immediately notified. It is a crime for you to leave the scene of such an accident before the police have talked to you and gotten all the information they need. Slow down because the lane ends ahead. Be prepared for workers and equipment ahead. Change lanes and maintain your current speed. 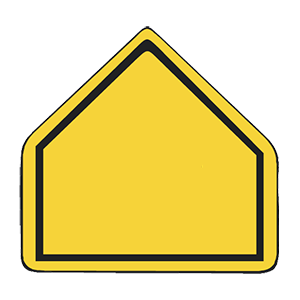 As you enter a work zone, signs and message boards will warn you of workers, slow-moving equipment, and/or closed lanes ahead. You should reduce your speed and be prepared to slow down or stop. Unless it seems safe to do so. A white rectangular sign indicates that you must obey the stated rule. 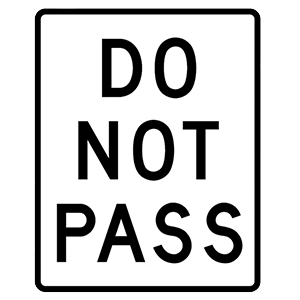 This sign means that drivers should not pass other vehicles for any reason. Reduce your speed slowly to encourage the tailgater to drive around you. Speed up to increase the distance between you and the other car. Apply your brakes to slow down, then resume your original speed. If you are being followed too closely by another driver, merge into a different lane. If there is no lane available for merging, wait until the road ahead is clear and slowly reduce your speed. This will encourage the tailgater to drive around you. You are approaching a school or school crosswalk. Slow down, drive with caution, and watch for children. 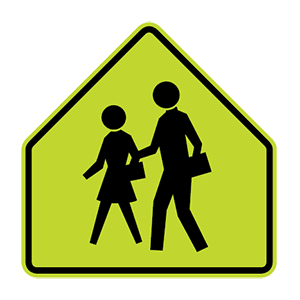 This sign is placed on roads near schools to warn drivers to slow down, drive with caution, and watch for children.